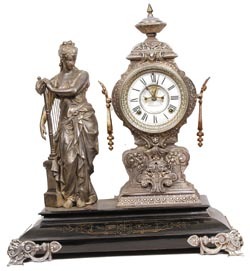 Ansonia Clock Co., statue clock, "Music", ca 1894. The harp player and the clock tower are both standing on a black enameled iron base that has stood the test of time pretty well. There are a couple of tiny paint chips, insignificant really, the paint overall is bright and clean. Surely I will be corrected by the more knowledgeable statue collectors, but it looks to me like the clock tower, statue, and feet on the base, were originally all silver except the ears on each side of the clock tower which were gold gilt. The statue has lost most of the finish, the tower and feet have held pretty well. As usual, the movement is 8 day, striking a standing gong, and running. Two piece porcelain dial is very good, signed below the open escapement, has a silver French sash, and a beveled glass. The heavy clock is 22" high and 19" wide. Ly-Ansonia No. 502.